Most companies worry about two types of new product risk—technical and commercial. So during which stage of product development do you resolve technical risk: Front-End, Development, or Launch? Development stage, right? At the beginning of this stage, you don’t know if you can deliver a solution that will satisfy technical requirements. By the end, though, you’ve reached 100% certainty. Either you’re certain you can deliver the solution—or certain you cannot. And when do you resolve commercial risk? This is the risk that your product performs technically as designed, but sells poorly. You launch your product with fanfare, and your customers react with yawns. Most companies reach commercial certainty in the launch phase. It might take a year or two after the launch, but they become certain of commercial success, commercial failure, or something in-between. 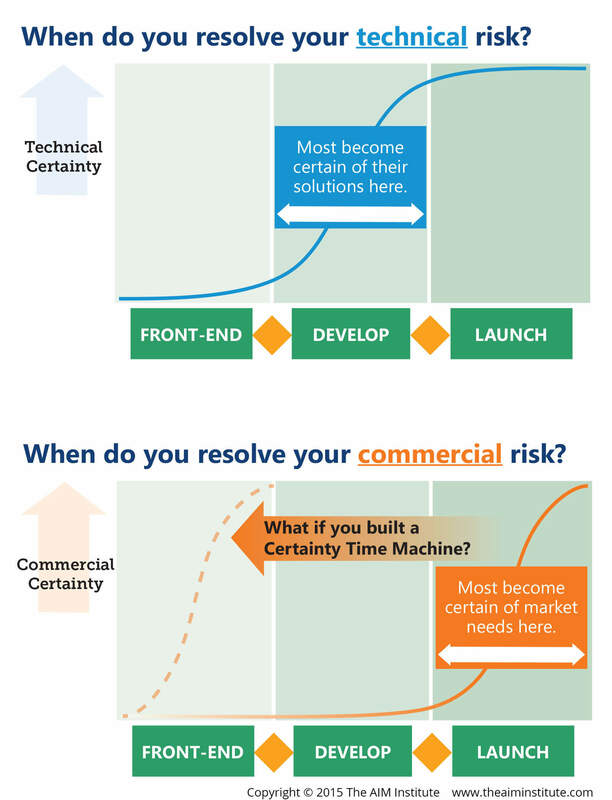 What if you could build a Certainty Time Machine… moving the commercial certainty curve from the Launch stage to the Front-End stage? You’d have less anticipation, thrill and drama, of course. But your new-product success rate would be much higher than the average company’s rate of 25%. And you could employ your R&D resources more efficiently… instead of wasting half of them as is typically done. Before your R&D personnel worked on developing great answers, they’d know the right questions… with complete confidence. To build your Certainty Time Machine—reaching commercial certainty in the Front-End stage—you must enter your customers’ worlds. You need a customer-centric perspective, approaching their level of understanding for all desired customer outcomes (end results). This not only delivers commercial certainty earlier; it delivers certainty on more information. With Launch stage certainty, you only know the market’s response to the single product design you lobbed in their direction. With Front-End stage certainty, you discover all their needs, opening many potential solutions to pursue. If you can’t predict B2B customers’ response to any new product design, it isn’t their fault. 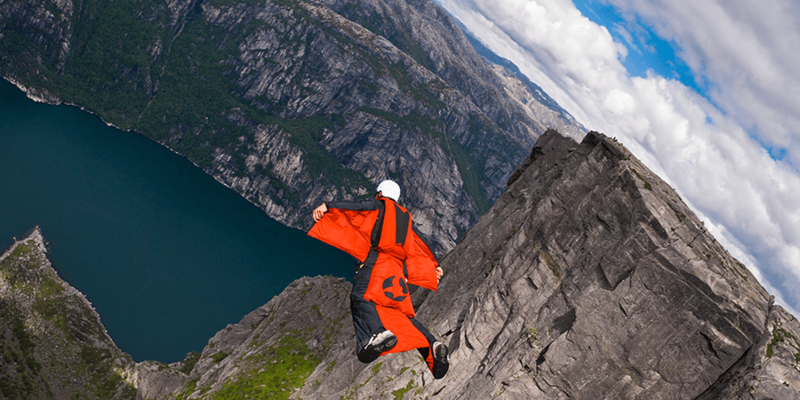 Can you really eliminate most commercial risk before entering the Development stage? For B2B… absolutely! The average B2B customer has a huge reservoir of untapped knowledge, interest, objectivity and foresight. Do you understand B2B customers’ outcomes well enough to predict their response to any new product design? If not, it isn’t their fault. You just didn’t ask in the right way. Fundamentally, this “asking” should occur in two steps. First, use divergent thinking in qualitative Discovery interviews. Preferably, your notes are projected for all to see as the customer volunteers every outcome they can think of. Why should you let the customer guide you to what they want to talk about? Because you don’t know what you don’t know. If you use a traditional questionnaire approach based on your perspective, you’re not likely to uncover exciting customer outcomes that could spark your next blockbuster. 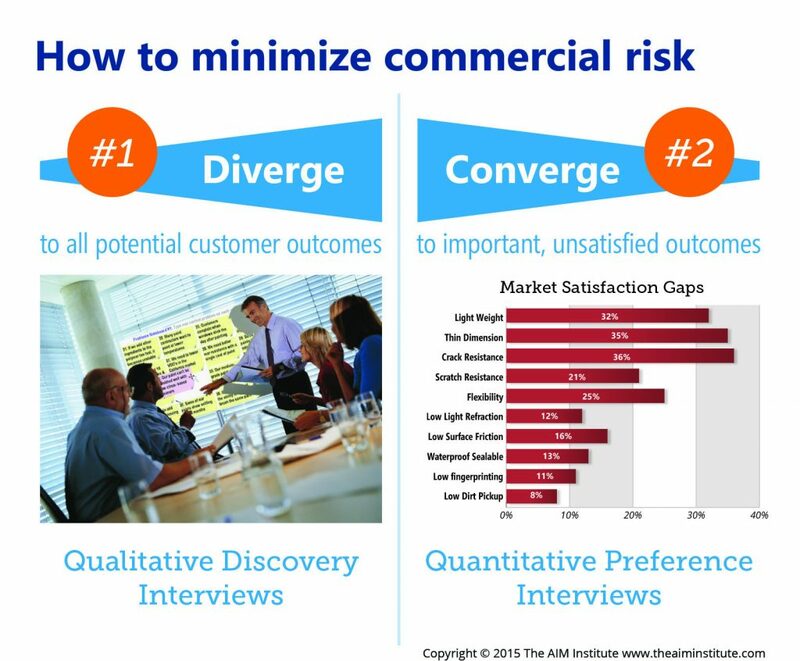 Second, use convergent thinking as you conduct quantitative Preference interviews. For each of several outcomes, you ask customers to rate importance and current satisfaction. This yields a Market Satisfaction Gap: The more important and less satisfied they rate an outcome, the higher the Gap. Now you know precisely which outcomes customers want you to work on. There is absolutely no chance they will pay a premium for your product unless it improves an important outcome with which they are currently dissatisfied. Conducting Discovery and Preference interviews is the most important thing B2B suppliers can do to minimize commercial risk. But it’s not the only thing. For each relevant outcome, the supplier must know how the customer measures performance, how good the performance must be, how well the next-best alternative performs, how much value could be created, etc. 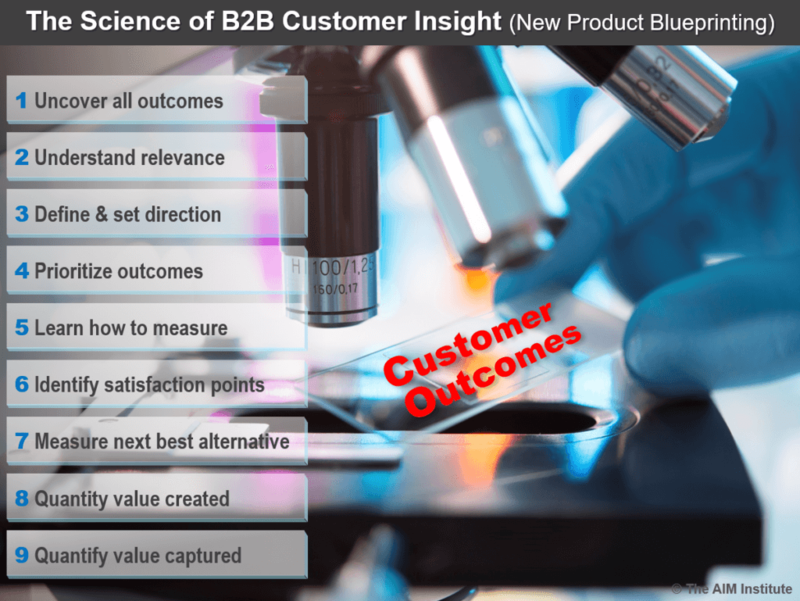 Think of this as the Science of B2B Customer Insight (aka, New Product Blueprinting). Just as a microbiologist puts a specimen under a microscope, so an outcome is studied in increasing detail. For each outcome, the “magnification” is turned up through nine levels, until the supplier approaches the same level of understanding as the customer. To learn more about this science, turn to page 8 in the white paper, Catch the Innovation Wave. Your company won’t change the way it innovates until enough people change the way they think. The AIM Institute has been adding new (free) resources to support your B2B innovation! View our full collection of B2B innovation resources, our collection of white papers, and our blog.